The international forum "Open Innovation" at the Exhibition of Economic Achievements, Moscow. Ocv. 29, 2015. RBTH selected the five most promising tech innovations at the Open Innovations Technology Show, which was held in Moscow on October 29 to November 1. Young parents almost always feel angst regarding their infants, but now they can count on support from the BabyFeel smart-cot platform developed by the Skolkovo Institute of Science and Technology (Skoltech). 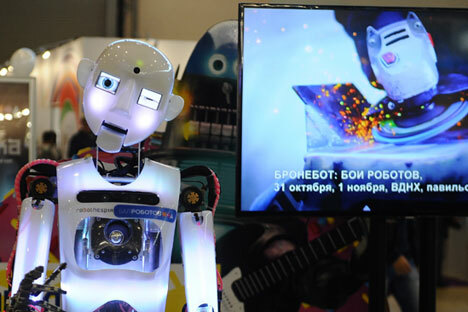 "It is very often difficult to understand a child's mood and condition, so parents ask everyone for advice," Dzmitry Tsetserukou, director of Skoltech's intelligent space robotics laboratory, told RBTH. "The cot will be able to analyze so-called 'baby language' in order to identify emotions." The cot will send phone messages to parents about their child's emotional and physiological state, take his or her photos, and select the best of them. Integration is soon expected with WhatsApp, Instagram, Facebook, and other social networks. At the moment, developers only have a 3D model, but they promise to release a prototype within a few months. This system was created by researchers at the St. Petersburg State Electrotechnical University (LETI), and it assesses the state of the airport runway, which is especially crucial in extreme conditions. The systems used in Russia today are either outdated or very expensive, costing more than $132,000. "Our system is several times less expensive than anything similar, priced at about $38,000," Anastasia Stotskaya, one of the developers, told RBTH. This technology is unique and based on the fully automated mode of an electromechanical braking device. Developers are also thinking about entering the world market. "First, we need to test the technology in Russia," said Stotskaya. "So, in the near future we plan to introduce it in airports." Developers at Atomtekhservis in the Ulyanovsk Region designed new pellets for nuclear safety, and the product already has interest from China. Boron carbide pellets are not new, but Russian developers have increased the duration of their usage by two-fold thanks to the new technology of plasma sintering. "The pellets are placed in the reactor and absorb neutron radiation," Albert Gataullin, director of the Dimitrovgrad Nuclear Cluster Development Center, told RBTH. "When they disintegrate, they need to be replaced. To do this, the reactor is stopped. While conventional pellets last for one year, ours last 2.5 times longer." Developers say the first commercial tilt-rotor, ERA-101, has many advantages over conventional UAVs. "It flies at much greater distances, at about 1,000 kilometers, and it is more flexible and efficient," said Vladimir Spinko, chief operating officer of the startup, Aeroxo. The company is now developing a new tilt-rotor ERA-100, which will be even faster, lighter and stronger. The company was founded in 2014, but already attracted an investment of $500,000 from the venture capital fund, I2BF Global Ventures. The tilt-rotor can be used to monitor infrastructure and agricultural projects, as well as for entertainment and other purposes. According to Spinko, there is interest from buyers in Arab countries. The creators of a new antioxidant have combined Soviet collections of algae and American technology. Denis Kuzmin, the CEO of Solix, said its products contain one of the most powerful and valuable pharmaceutical antioxidants – astaxanthin. "The world market for astaxanthin is estimated at several billion dollars," said Kuzmin, adding that most companies synthesize it chemically, but the Russian-American company was able to obtain it naturally from micro-algae. The goal of research is to find microorganisms that grow quickly and produce a large amount of this substance. "Here we have a clear competitive advantage because we work with the largest collections of such microorganisms," says Kuzmin. The collections of algae made in the USSR were left unstudied for a long time due to the lack of necessary equipment. Solix's main facilities are located at the company's headquarters in Colorado.